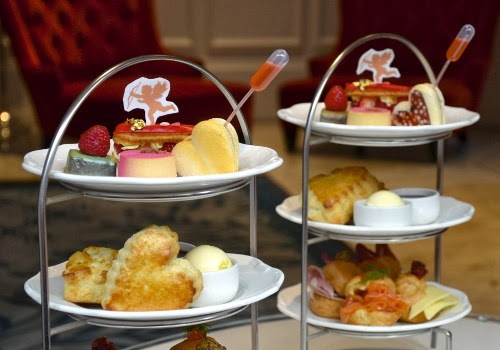 Treat a loved one to a romantic Valentines Afternoon Tea at The Ampersand Hotel, available from 7th February until 16th February 2014. One of the most stylish hotspots in Kensington, The Ampersand is a privately-owned luxury London hotel that combines contemporary excellence in design, service, food and technology. Guests can enjoy Gloucester old spot ham, sauce gribiche; Cheese with fruit chutney; H.Forman & Son London smoked salmon, dill and cream cheese; Coronation chicken - followed by white chocolate scones, served with Devonshire clotted cream and homemade strawberry preserve. Pastries - Caramelised white chocolate mousse and rose jelly, Red berry and vanilla cream eclair, Heart-shaped macaroon with chocolate ganache and strawberry juice pipette, Dark chocolate coated raspberry marshmallow. Valentines Afternoon Tea is available from 7th February until 16th February 2014 from £32.50 per person or £44.50 with a glass of Champagne. Guests booking between Monday to Friday will receive a complimentary glass of Champagne. Mmm this looks delicious! Just my kind of treat. Love the heart shaped scones! Plus, nothing beats a bit of Devon Clotted Cream!